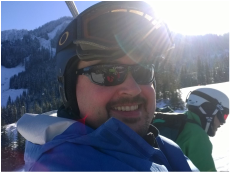 Scott is the Executive Director of the Kitsap Ski School program and coordinates our contracts and technology. In addition a to planning the season and getting everything set up, Scott also helps monitor Ski Patrol for injured Kitsap Ski School students, contacts parents in the event of a student injury, and drives our Emergency Support Vehicle. Scott has been a skier since high school and during college led a small Ski Shuttle program for the Residence Halls at the University of Washington. Scott loves to ski with his wife and his two boys and his preferred equipment is a set of Blizzard Cochise skis. In his spare time, Scott is the Principal of Central Kitsap Middle School. Toby is the volunteer director with the Kitsap Ski School. He has been snowboarding for over 25 years, and many moons ago, he used to teach ski school lessons. His favorite run at Stevens is the back side, and he loves to board with his 3 boys and wonderful wife. In his spare time, he is the principal at Clear Creek Elementary. Jon participated in Ski School many moons ago when he attended CKJH. Jon has a passion for the mountains loves playing in the snow with his wife and three kids. His favorite run at Stevens is whichever one has the most powder. Jon loves to read, drink coffee, talk philosophy, and ride motorcycles when he isn’t busy with family and football. Jon also works as a pastor in the Silverdale/Bremerton area.